For a car-buying experience that's designed to fit your busy schedule, come into Greenville Chrysler Dodge Jeep Ram, located in the heart of Greenville, TX and serving Greenville and the surrounding Northeastern Texas communities with a wide selection of the best in transportation, including the smoking hot 2015 Chrysler 200. In just a few short years, the Chrysler 200 has made its mark on this historical car company, and that trend doesn't show any signs of slowing down for 2015. The Chrysler 200 is an envy-inducing, highly aerodynamic luxury coupe, and is a sight to behold both inside and out. The new Chrysler 200 has been completely redesigned for 2015 and a premium selection is now available at Greenville Chrysler Dodge Jeep Ram, your friendly neighborhood Chrysler dealer. Standards for the Chrysler 200 are numerous and highly coveted, ranging from keyless entry and ignition, cruise, and a USB input, while optional features include Chrysler's infotainment Uconnect system, Bluetooth hands-free, a large in-dash infotainment touchscreen, satellite radio, rich leather upholstery, a rear view camera, handy blind spot detection, and automatic climate control. Despite the sporty handling and styling, the Chrysler 200 has been equipped with impressive safety features like traction control and anti-lock brakes, a full line-up of airbags, and stability control. Powering this tidy rocket from Chrysler is one of two engines. The first is a 2.4-liter 4-cylinder that returns 184 horsepower and 173 pound feet of torque. This year's optional engine will help you get the absolute most out of your new Chrysler 200, thanks to this 3.6-liter V6's near 300 horsepower and 262 pound feet of torque. 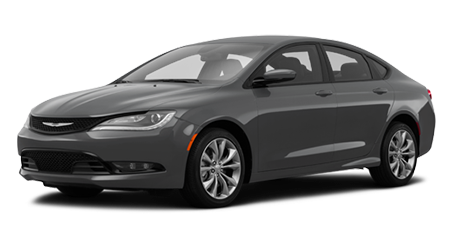 You can test drive a new 2015 Chrysler 200 today at Greenville Chrysler Dodge Jeep Ram, just a stone's throw from Commerce and Rockwall, Texas—so what are you waiting for? Ask about our affordable Chrysler 200 financing, and let Greenville take the work out of your next new or used car purchase.